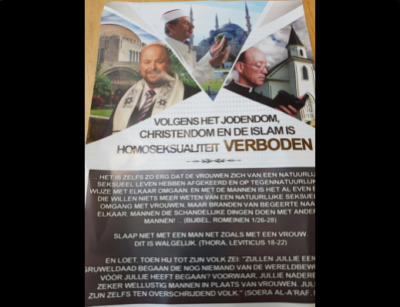 A pamphlet distributed in Amsterdam last year has led to the prosecution of one man from Rotterdam and two from The Hague. 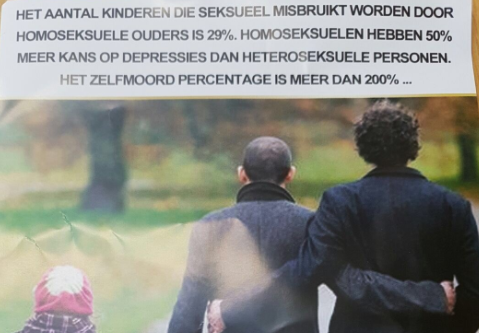 The pamphlet starts by saying, in Dutch, that Christianity, Islam, and Judaism all reject homosexuality. It presents “facts” about homosexuality and the words of a Romanian couple that is angry their children were adopted by a gay couple in the United Kingdom. The police have received over 75 complaints about the flyer. The men will be prosecuted for group insult, inciting discrimination and distributing discriminatory statements. Police said they were identified by surveillance video. The general pattern of the book is repetitious and predictable: the book shows a picture of a fossil and a photo of a living animal, and declares that they haven’t changed a bit, therefore evolution is false. Over and over. It gets old fast, and it’s usually wrong (they have changed!) and the photography, while lovely, is entirely stolen. According to Turkish media, Yahya has filed thousands of defamation suits to silence critics in Turkey. The movement around Yahya has been described as a “sexed up” cult.